The Walking Dead returns this Sunday. Michonne is ready, are you? 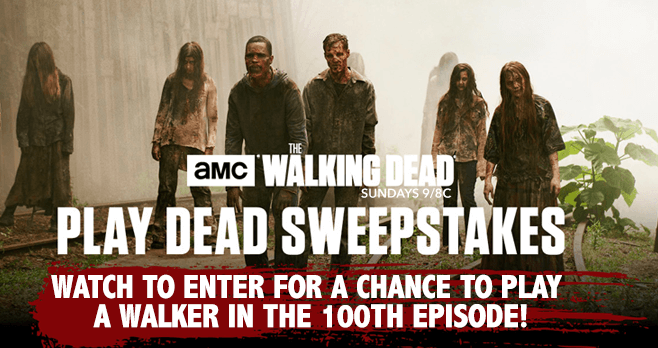 AMC invites you to watch the show and enter the AMC Walking Dead Sweepstakes 2017 at AMC.com/PlayDeadSweepstakes for a chance to play dead as a walker in the 100th episode. Watch new episodes of Season 7 on Sundays at 9/8c on AMC and look for two code words that will be revealed at various time during the episode. Be sure to keep an eye open during commercial breaks too. Then, visit www.amc.com/playdeadsweepstakes to register for the Walking Dead Sweepstakes and provide the correct code words to be entered into the Grand Prize Drawing. Can’t watch the show this Sunday? Come back during the Weekly Sweepstakes Period to discover the two code words below. Eligibility: The AMC The Walking Dead Play Dead Sweepstakes 2017 is open only to legal residents of the 50 United States and the District of Columbia (excluding Puerto Rico, Guam, the U.S. Virgin Islands and other United States territories), and Canada (excluding Quebec), who are 21 years of age or older as of the date of their entry. Sweepstakes Period: Begins at 9:00:01 pm ET on February 12, 2017 and ends at 5:59:59 am ET on April 3, 2017. Limit: There is a limit of one entry, per person, regardless of email address used, per Weekly Entry Period. Random Drawing: Four Grand Prize Winners will be selected and notified by mail, email or telephone within 72 hours after the end of the Sweepstakes Period in a random drawing from among all eligible entries received during all Weekly Entry Periods. Winner’s List: For a list of prize winners, available after the Sweepstakes Period has ended, send a stamped, self-addressed envelope, to be received by May 5, 2017, to AMC’s The Walking Dead Play Dead Sweepstakes Winners List, AMC Networks Entertainment LLC, 11 Penn Plaza, New York, NY 10001 or visit www.amc.com/playdeadsweepstakes. Requests will be fulfilled/name will be posted, after the winner’s name has been verified. Sponsor: AMC Network Entertainment LLC, 11 Penn Plaza, NY, NY, 10001. For complete details, including Official Rules, visit http://www.amc.com/shows/the-walking-dead/exclusives/play-dead-sweepstakes. AMC’s The Walking Dead Dead Giveaway Sweepstakes : 115 The Walking Dead prizes are up for grab ! Sure would love to WIN, I’m going to keep watching regardless #Love the show. Please come back Carol, They need you. We need Carole back in action! Wait til she finds out Glenn and Abraham are dead…Began many want you!